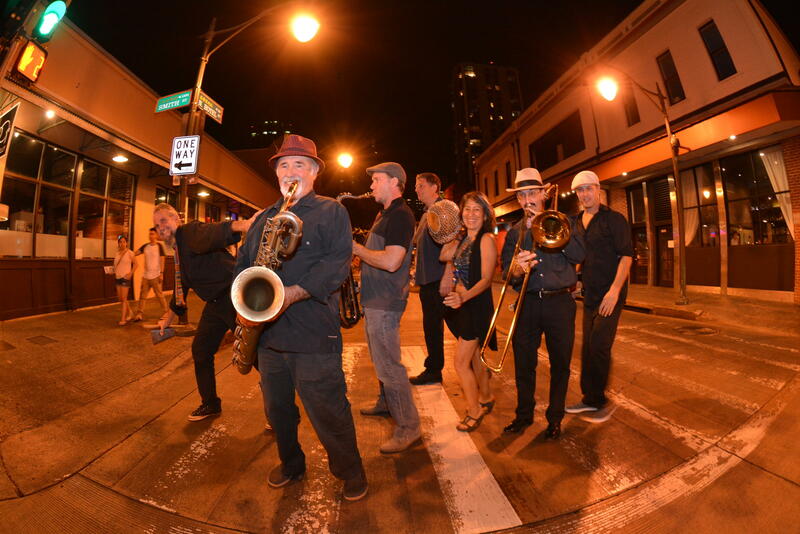 Inspired by the creative spirit of Hawaiʻi Public Radio, Hawaiʻi’s only Afro Funk Soul band Good Foot will be showcasing their original compositions in the Atherton Studio on Saturday, June 10, 7:30 p.m. Known primarily for their high energy club performances, their Atherton debut promises music that will get people up on their feet dancing, while keeping their brains dancing as well. Good Foot’s eight band members are Capt. Ray Beatty on baritone sax, Jason Forester on bass, David Goldfarb on alto and tenor trombones, Babatunji Heath on drums, Mark Iseman on guitar, Lori Kimata on percussion, Rollin Wakely on guitar and tenor sax, and special guest vocalist Melody Heidel. Three young featured dancers will also be making their “surprise” appearance. Reservations for the premier of Good Foot in the Atherton may be made online at www.hprtickets.org or by calling the station (955-8821) during regular business hours. Tickets are $30 general, $25 for HPR members, and $15 for students with ID; service fees are applied to online orders. The Atherton Studio is located at Hawaiʻi Public Radio, 738 Kaheka Street. Doors open a half hour before the performance. Advance ticket purchase strongly encouraged as the house is frequently sold out before the performance date. Good Foot Hawaii is a collaboration of musicians exploring the rich heritage of the musical expressions which have traveled back and forth between West Africa and North America, an ongoing musical migration and conversation that has produced Jazz, Funk, Soul, Afro Beat and much, much more. The band creates original music influenced by the treasures that it unearths, as well as interpreting the classics, rare grooves, and new gems from their contemporaries who share their love for this music. Driving bass and drums, dancing percussion, shimmering guitars, soaring vocals, and wailing horns are just a few components of the Good Foot experience. A YouTube sample of their music, shot in the Atherton.